Sunridge is a popular location for special events in both the summer and winter. 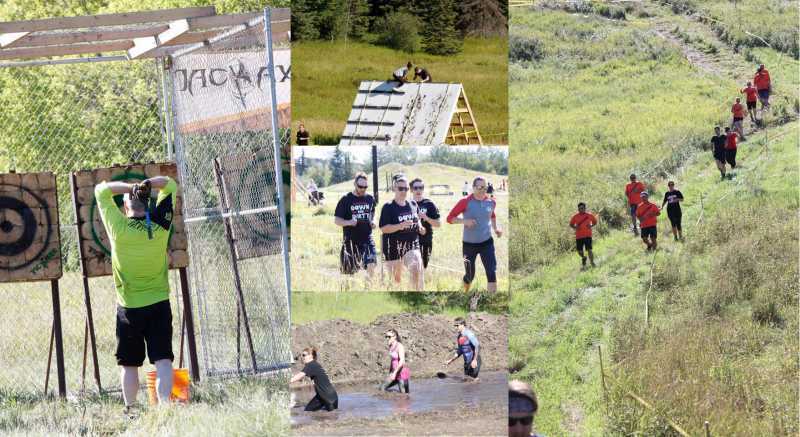 Events hosted here include mountain bike races, running races and the popular annual Down and Dirty 5km Obstacle Course. If you are planning a special event or activity and plan on using the hills here at Sunridge, you must book in advance with us to ensure there are no conflicts with other activities on the hill. Normal summer daily activities of course do not require permission, but any event where you register participants, advertise the activity and charge a fee for the activity, must book with us. As we are located in the Strathcona Science Provincial Park, you must also obtain permission from the Province for your event if the event takes place in the summer. In the summer, your booking includes use of the ski hills only and does not include use of our chalet nor the ski lifts. Public washrooms are available in our parking lot and if you are expecting over 100 people, you should plan to rent porta-potty's as well. All winter events require specific approval from us so that it does not conflict with regular winter operations. A fee of $300 is charged for your group to use the ski area grounds for a summer event. This fee partially covers our summer costs in maintaining the grounds including garbage pickup. This fee must be paid in advance prior to your event. All the information you need to book your event is listed on the right. Any organized activities on our hills that have not booked in advance, received all necessary approvals, paid the $300 fee and completed the required paperwork are not permitted. To book your event in the summer, please complete the Summer Event Booking Application and email it to us at info@sunridgeskiarea.com. If your activity is permitted and the date you've requested is available, we'll tentatively book your group on our calendar. If your event takes place in the winter (early Nov. to late Mar. ), just email us or call us at 780-449-6555. Once you have tentatively booked with us, you must also have permission from the Province to hold your summer event as we are located in the Strathcona Science Provincial Park. Information on getting a provincial permit can be found here. You must complete the provincial permit application form and email it to the Alberta Parks Central Region office. You must carry liability insurance for your event in the amount of at least $5million and Sunridge Ski Area must be a named additional insured on your insurance policy. The typical wording on your insurance certificate is "Calido Recreation Management Inc. O/A Sunridge Ski Area and their directors, officers, employees, volunteers, guides, agents, independent contractors, representatives, successors, assigns and all those in law for whom they are responsible are added as Additional Insured's, in respect only to the operations of the Named Insured. This Additional Insured status will be primary insurance over and above any other insurance carried by the Additional Insured's." We require a copy of your insurance policy and a copy of your insurance certificate at least two weeks prior to your event as both of these documents must be approved by our insurance company. Failure to provide an approved insurance policy and insurance certificate will result in the cancellation of your event. Each participant must sign an approved Waiver of Liability. We recommend that you use our waiver of liability for your event but if you have your own waiver, it must be approved by us prior to your event.